This beautiful life-size painting of four children is by William Hogarth. 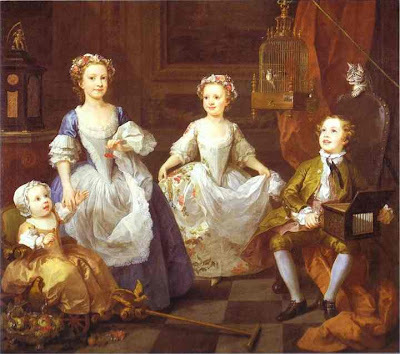 The children are (from left to right) the infant Thomas sitting in a gold-leaf gilded go-cart; Henrietta in a blue dress holding two cherries; Anna Maria in a flower-print dress; and Richard who plays the sérinette or bird organ. This is illustrated in the painting by the predatory cat stalking the goldfinch in the gilded suspended cage.The gilded cage could be seen as the rich protector of the innocent, then released into a dangerous world, an allegory of the child becoming an adult and having to deal with an altogether more dangerous reality. thank you...I love that picture too.